At Bridge Tool & Die, Inc. we pride ourselves on excellent manufacturing and customer service. We seek to show this every day by offering customer service that challenges the status quo. Our company has over 100 years of combined experience in precision machining and grinding services. We are quality minded and ISO 9001:2008 certified. 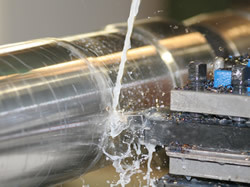 From the onset, our company has offered full service machining of steel and other metals. In additional our carbide grinding specialties we have another facility that is entirely dedicated to manufacturing steel tooling and plastic injection molds. There are many applications where we are utilizing our general machining personnel to produce tooling that is a combination of steel are carbide. Our CNC Lathe and Milling capabilities provide us with the capability of producing incredibly complex tooling, molds, stamping dies, progressive stamping dies, and robotic arm devices. Essentially, we are capable of quoting any steel or carbide parts, from job-shop steel requirements to complex plastic injection molds with first shot requirements. Our capacity in carbide stamping dies and extrusion dies make us your one-stop shop for all your tooling needs!